Elgin, Ill., Feb. 11, 2013—Elgin Sweeper has introduced a modified Crosswind® Specialty Track Sweeper that is set to make its debut at NASCAR (the National Association for Stock Car Auto Racing, Inc.) racetracks around the country this racing season, beginning with the Daytona 500 on Feb. 24. The Track Sweeper plays a supporting role in a new racetrack drying initiative that features a combination of air power and vacuum suction to dry rain-soaked racetracks. The regenerative air Track Sweeper adapts features from Elgin Sweeper’s highly successful Crosswind GRS (glycol recovery sweeper), a special-purpose sweeper used to vacuum liquid glycol from airport runways. 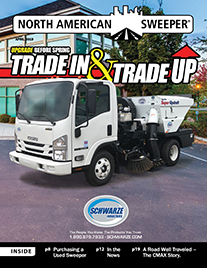 This specialty sweeper includes unique features developed for racetrack sweeping and maintenance applications, such as a side air-blast nozzle, a reverse sweep system, a 20,000 CFM-rated blower and a hydraulically-driven side broom with plastic bristles. During track testing conducted in conjunction with NASCAR last November in Daytona, this same vacuum technology proved to efficiently vacuum water from the pores of the racetrack, and worked even better with the new track-drying technology designed by the NASCAR Research and Development Center. Working together to remove moisture from the track surface, both technologies dramatically accelerated the drying time. Developed as a more effective alternative to the current track-drying method, the system, featuring the Crosswind Track Sweeper, is expected to expedite the process. ServiceMaster Clean is the official sponsor of the caution periods at the 19 International Speedway Corp. and Speedway Motorsports, Inc. tracks, as well as Dover International Speedway. All cleaning and drying vehicles and equipment—including the Crosswind Track Sweeper—used at these races during a ServiceMaster Clean Caution period feature the bright yellow ServiceMaster Clean colors. The Crosswind Track Sweeper can clean a wide, 117-inch path with its side broom and pickup head, using a 20,000 CFM-rated blower to provide a high-volume air knife to blast air while picking up debris, oil-dry and standing water. With its side air-blast nozzle, debris can be blown off the track for distances up to 50 feet. The sweeper has a generous 8-cubic-yard hopper to contain ample track debris and water. The Freightliner M2 chassis features dual controls for operation from either the right- or left-side of the cab. 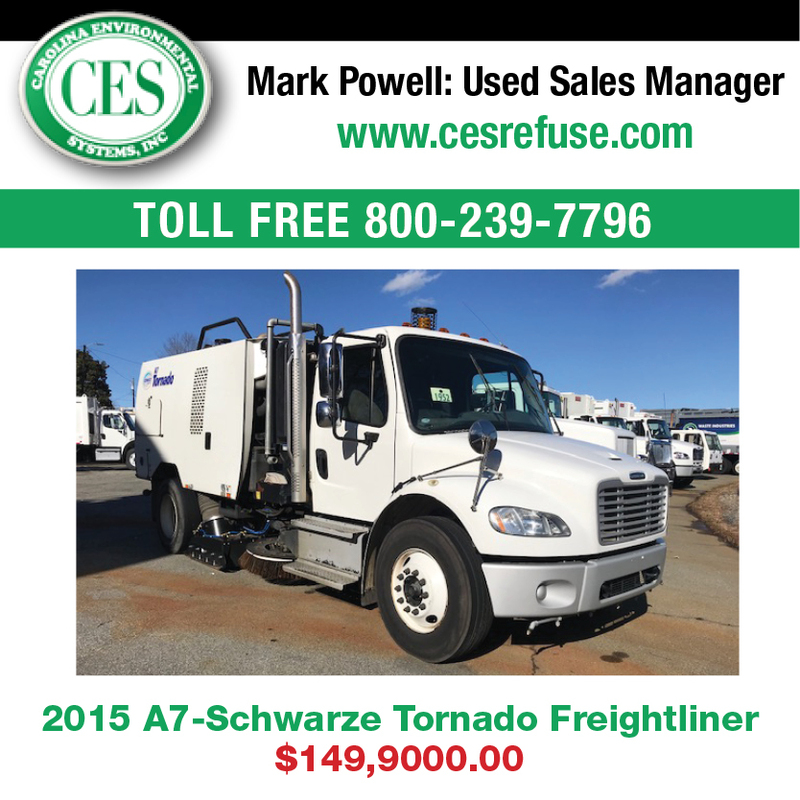 The sweeper features dual engines, a 115 hp turbocharged diesel for the sweeper and a 200 hp diesel for the chassis. For enhanced visibility, the sweeper and its chassis are equipped with a multiple array of amber safety lights. For remote cleaning of the bigger jobs, such as an impact to a sand barrel attenuator, the unit also features a soft wall cleaning attachment and a large jib boom-mounted 8-inch rear vacuum hose. The specialty sweeper was modified with input from racetrack officials in the NASCAR circuit. 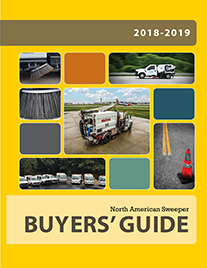 Elgin Sweeper representatives—along with Jeff Miles from Key Equipment & Supply Company, an Elgin Sweeper dealer based in Kansas City, Kans.—worked with NASCAR to address track maintenance issues, as well as fire, safety, medical and security concerns. A lifelong racing enthusiast, Miles is also a lead driver for the Richard Petty Driving Experience and has logged more than 350,000 miles in NASCAR-style stock cars. Traveling to tracks across the country has given Miles an added appreciation for clean track conditions. For more than a year, Elgin Sweeper conducted testing to develop a new side-air blast nozzle on the Crosswind Track Sweeper, collaborating with the California Motor Speedway. To verify that the sweeper will operate effectively on the steep banks and inclines associated with various racetracks around the country, Elgin Sweeper conducted additional testing for maximum tilt angle at the Caterpillar, Inc., research facility in Peoria, Ill. An in-cab angle measurement system on the Track Sweeper audibly and visually alerts the operator when steep incline conditions approach the maximum tilt angle. The new air blast nozzle on the Crosswind Track Sweeper was designed using computer-aided design (CAD) modeling, computational fluid dynamics (CFD) analysis and internal testing which streamlined the process for validation of maximum potential air velocity to move more debris to further distances. The new design incorporates linkage that allows the operator to adjust nozzle tilt and includes in-cab control to further maximize productivity and safety, eliminating the need for the operator to exit the cab during a ServiceMaster Clean Caution period. The side air nozzle delivers more airflow at higher velocities. The powerful, 20,000 CFM-rated blower is ideally suited for locations where jet dryers can’t be used, such as grass on the inside field, pit areas and weepers (cracks on a racetrack where water seeps through). 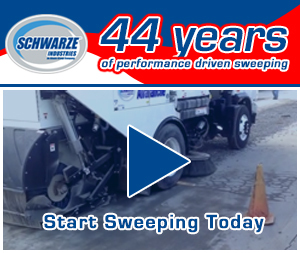 The blower volume, nozzle height and angle can all be controlled, making the sweeper even more maneuverable and responsive. To improve visibility from the sweeper cab when operating in reverse, Elgin Sweeper has standardized back-up cameras on all sweepers. For improved productivity and safety on the racetrack, Elgin Sweeper integrated this feature on the Crosswind Track Sweeper with the reverse sweep system, allowing the operator to safely use sweeper functions while moving in reverse. This system includes additional safety lighting, an increased decibel rated back-up alarm and a rear object-detection sensor that can see through dust, rain, daylight and darkness to detect any objects or pedestrians behind the sweeper. “This system greatly improves the operator’s awareness of the surroundings while sweeping on the racetrack and in the heavily populated pit areas,” Crockett said. In addition to sweeping the racetracks, the Elgin Sweeper Crosswind Specialty Track Sweeper can also quickly and efficiently remove standing water, rubber and debris in and around the pit area, which contributes to the overall safety of the racers, their crews and spectators. According to Crockett, the speed and maneuverability of the Crosswind Track Sweeper ensures prompt response on and off the track. “This sweeper can get from job to job and make quick work of any sweeping challenges that come up before, during and after a race,” he said. Using the same 20,000 CFM system, the soft wall-cleaning attachment on the sweeper handles water, debris and rubber cleanup. The attachment features a 20-foot lightweight hose for easy operator control, an aluminum vacuum end tube for increased durability and a quick-disconnect for fast and easy installation and storage. For general cleaning, a larger rear-door heavy-duty 8-inch diameter hose is available. Featuring a polyethylene bristle broom construction developed for airport and runway use, the hydraulically-driven, high-torque side broom can be controlled pneumatically by the operator inside the cab. The side broom extension allows track cleaning right up to the wall, while keeping ample sweeper distance from the wall for track safety light clearance. Designed for quick and efficient vacuum removal of standing water on racetracks, the Crosswind Track Sweeper features a rear-door decant system which allows the machine to drain the liquids without opening the door. A large decant valve allows the discharge to be controlled using a hose. A debris filter cage installed on the door prevents clogging. During a ServiceMaster Clean Caution period, high-efficiency oil dry is applied to the racing surface. The Crosswind Track Sweeper features an internal dust-suppression system, which injects water on the suction side of the regenerative system to prevent the airborne dust commonly associated with jet dryers and air-blast systems. Elgin Sweeper also introduced application-specific design changes to fluid tanks and sweep gear on the new Crosswind Track Sweeper to enable the sweeper to operate on the high bank turns common to most NASCAR racetracks. 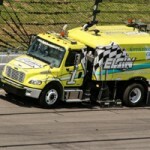 Professional stock car racing fans can follow along with the Crosswind Track Sweeper throughout the 2013 racing season by visiting Elgin Sweeper’s Facebook page. For more information on the Crosswind Specialty Track Sweeper, please contact your local Elgin Sweeper dealer, or visit www.elginsweeper.com to find a dealer near you.